It’s finally here, the worst day of the year, thanksgiving. The night before I had laid down on the grass in the turkey pen, and the next thing I know, I’m stuck in the trunk of a bright blue car. I’m doomed! I know what’s gonna happen, if I don’t make an escape, in five hours I’m goin’ to heaven. I have to make an escape plan. Ahha! There was some old junk in the back of this car. There was a brown ball of yarn, some craft feathers, two googly eyes and a bottle of glue. Ding-Ding, I had an idea. I quickly glued everything together. There, and just in time too. Now the car was pulling into the driveway. I hope my clone of a turkey looks real. I quickly snuck into the garage and went through the doggy door. Now I’m inside their strange looking house. First I wandered into what looked like a bedroom. I found a door, and it was an empty closet, the perfect place to hide. After a while, I heard voices, and saw some big ugly feet. But to my perfect luck, the big smelly feet left the room. I peeked through a crack in the door, and no one was there. So, I walked into a different room when I noticed something that looked familiar, the OVEN. I looked on a countertop and I saw a bottle labeled: TURKEY SEASONING. I knew what this meant, I’m toast! At the sight of that bottle I darted into what looked like another bedroom. Then, something caught my eye, a sheet of paper lying in the middle of the floor. I took it by my beak and had a glance at it. EUREKA! It was a map that lead back home, to the turkey pen! I knew I could abandon this piece of junk those humans call home! Uhoh. All that screaming had made a hairy guy named Herbie to walk in. 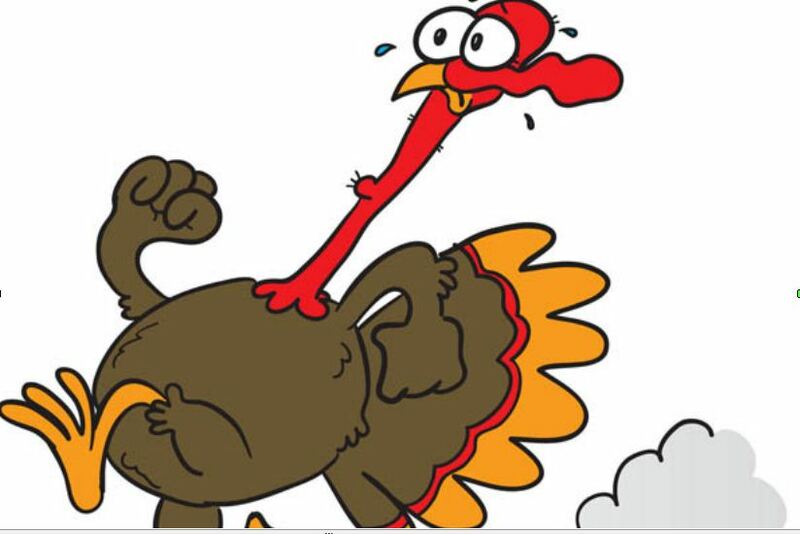 There was only one option left, the inappropriate turkey attack. I quickly did my meanest gobble, then I jumped up into his shirt! I found a button, and I bit it! Apparently it was the button that told the humans to start screaming like my grandma on a rollercoaster at Disney World. Then, I raced toward the front door, the map clutched tight in my beak. But that stupid Herbie guy was still following me, and screaming. Then, I had an idea. I decided to use my manners and let Herbie go first. So, I stopped, but he didn’t notice, and he ran right into the door. While he was unconscious, I jumped onto his head, turned the doorknob and left that dangerous house behind forever. I was so happy to be going home. Then, after what seemed like forever, I finally made it back. In conclusion, this thanksgiving turned out not to be so bad after all. The family I had escaped from, decided to eat ham for thanksgiving. They gave up on turkeys. It turns out, Herbie’s alright. I heard he was screaming for hours, but he’s alright, I’m sure he is. But most importantly, I’m still alive. It’s been a rough thanksgiving, but it’s also been one I won’t forget. I’m glad I made it. Great fun to read. Watch for this writer in the future. She’s a delight. My daughter, Mikayla, wrote this for a school assignment prior to Thanksgiving. It’s even better when she reads it aloud. We’re very proud of her.